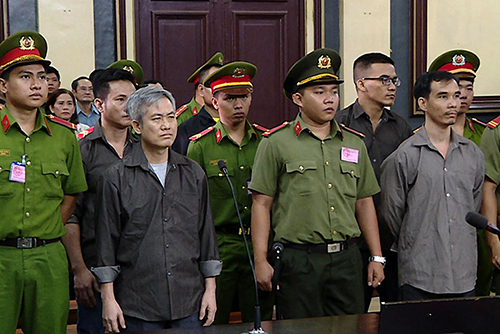 The Ho Chi Minh City People's Court on Friday sentenced Luu Van Vinh, 51, to 15 years in prison; and four other men, accused as his accomplices, to 8-13 years each. After serving their prison sentences, the defendants would also be placed under house arrest for another three years, the court ruled. According to the indictment, Vinh and his accomplices worked together to establish an organization called the "National Alliance of Vietnam." The organization allegedly criticized and distorted the policies of Vietnam’s Communist Party in an attempt to overthrow the government. The defendants were arrested after police caught them distributing documents promoting the organization at a church in Ho Chi Minh City's Tan Binh District in November 2016. Investigators subsequently identified Vinh as the group's mastermind, responsible for setting goals and policies for the "National Alliance of Vietnam" as well as recruiting members for the illegal organization. Other defendants meanwhile were found guilty of serving as his advisors in expanding and financing the organization, encouraging and strengthening its new members' belief and making preparations for the organization to establish its own army. At the trial on Friday, only one of the defendants admitted to the crime. Vinh and his three accomplices refuted the confessions they had made during the investigation. They claimed that they had simply been making jokes on Facebook and had committed no crime. Prosecutors however said that there was enough evidence to convict them. The court concluded that the defendants' actions had violated national security, as well as the existence and strength of the people's administration and the State of Vietnam, meriting strict punishment. Under Vietnam's Penal Code, "carrying out activities aimed at overthrowing the people's administration" is a crime punishable by 12-20 years in prison, life imprisonment or the death sentence for organizers, instigators and active participants, while accomplices could face 5-15 years in prison. In August this year, the HCMC court had sentenced 12 members of the "Provisional National Government of Vietnam," a U.S.-based group that aimed to overthrow the Vietnamese government, to 5-14 years in prison. A member of Viet Tan, an organization Vietnam has classified as a terrorist group, was also sentenced to 20 years in prison by a court in Nghe An Province that same month. In a similar case, a Hanoi court in April sentenced six members of the "Brotherhood for Democracy," an organization accused of trying to overthrow the government, to 9-15 years in prison.